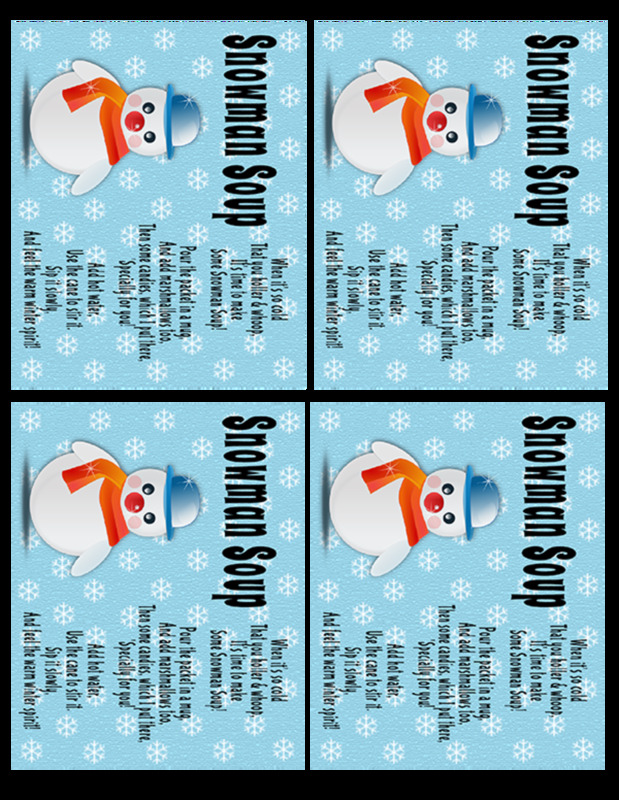 The Snowman Soup Printables are the property of the author Corrinna Johnson and are licensed under a Creative Commons Attribution-NonCommercial-ShareAlike 3.0 Unported License. They are free for personal use only and you must provide a link and credit to this page if you use these designs on the internet. You are not allowed to use these printables for commercial purposes. When sharing, please link to this page for them to download the files. You are not permitted to share the files link directly. Brrr...It's Cold Out There! Warm Up With A Delicious Mug Of Melted Snowman Soup! 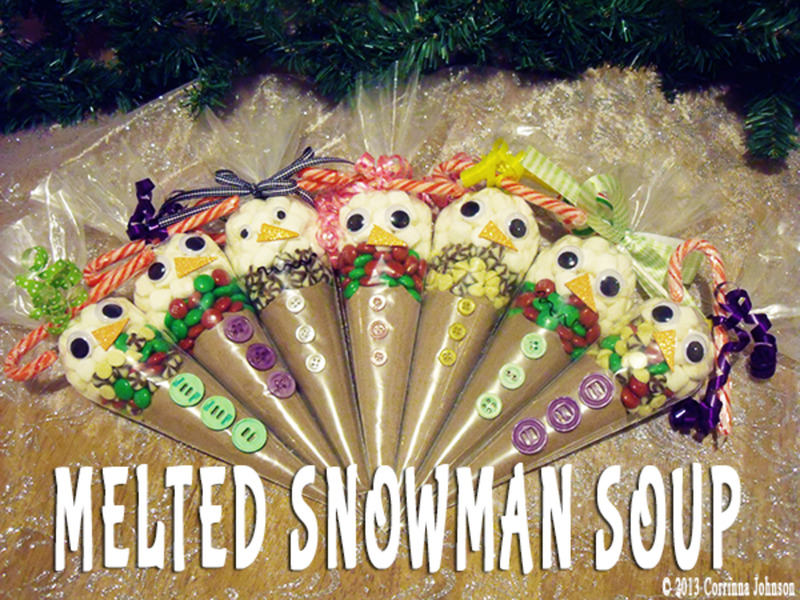 Warm the hearts and souls of your friends and family with a delicious homemade gift of Melted Snowman Soup. 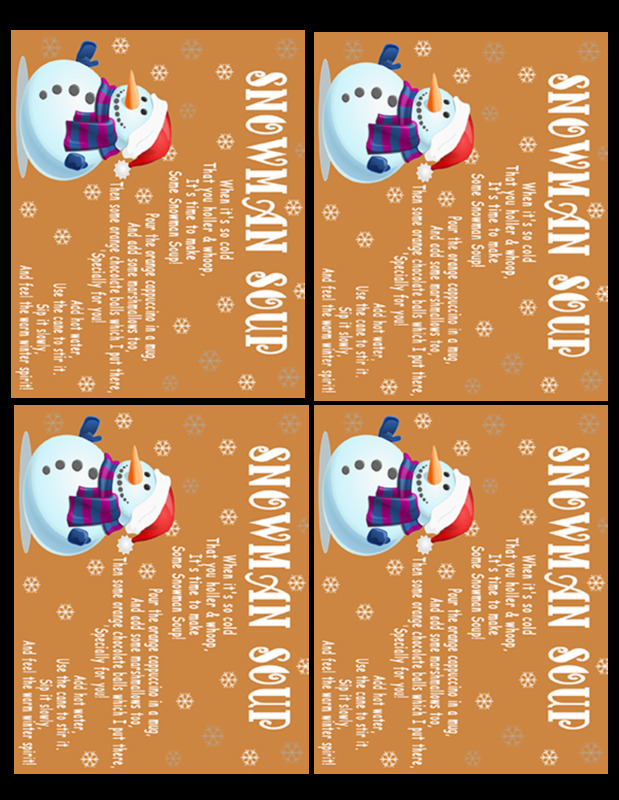 I just finished making a bunch of these for everyone on our Christmas list this year and because they are so freaking cute and adorable, I wanted to share my snowman soup recipes with you. I have included a simply delicious hot chocolate recipe suitable for everyone and four grown-up versions for the adults, along with free printable snowman soup poem tags and creative suggestions for gift giving. These are a simple and inexpensive homemade gift or stocking stuffer to make for everyone on your list from your kid's classmates and teachers to your friends, family, neighbors and co-workers. You will need 1/2 cup of hot chocolate, 1/4 cup of chocolate chips and 1/2 cup of marshmallows per bag of snowman soup. A small can of hot chocolate will yield 5 bags and a regular sized bag of chocolate chips will yield 6 bags. If you buy the hot chocolate and chocolate chips when they are on sale, each package of snowman soup will cost you between $2.00 and $2.50 to make. Substituting coffee for hot chocolate may increase your costs and will vary depending on the brand of coffee you use. To stretch my dollar even further, I buy the value pack of 100 disposable decorating bags from Amazon, costing me only .20 cents apiece. Turn this into an extra special gift by adding a cute snowman mug, a box of chocolates or cookies, a bottle of liqueur or a pound of coffee and still stay within a budget of $5.00 to $10.00 a person if you shop wisely. You can find some really adorable mugs and containers at dollar stores and grocery stores often have great sales on coffee and chocolates during the holidays. 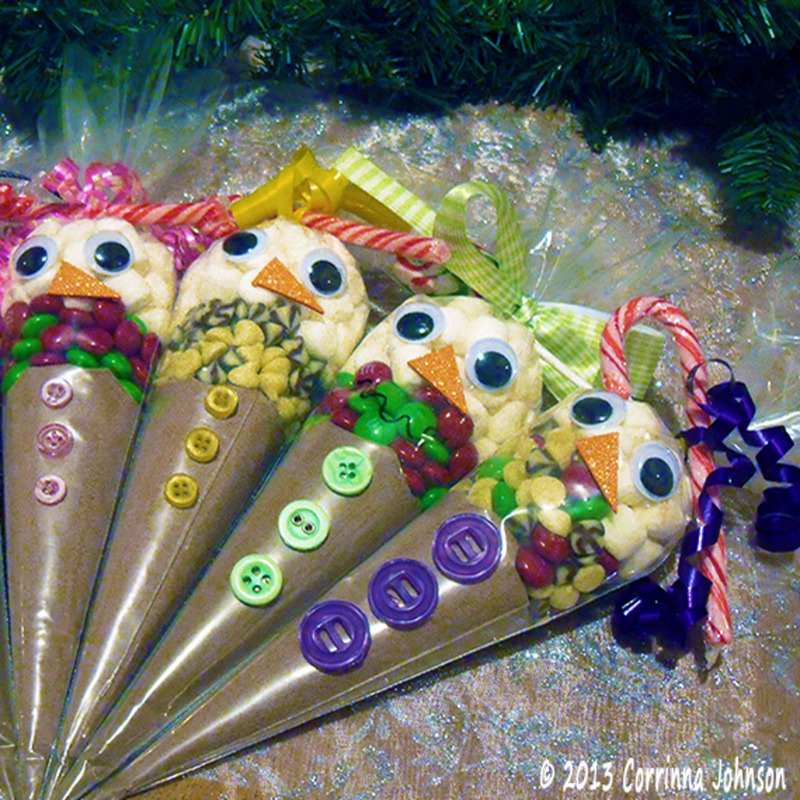 This is a super easy and fun gift that the whole family can help make. My preteen pitched in and we made them for her "bff's", her teachers, our family and close friends, our neighbors and the Christmas family my daughter's leadership class is sponsoring. My daughter and I had a little assembly line going; she measured and filled the bags with hot chocolate and I secured the bags with elastics, then she placed them inside another bag and topped them with candies and marshmallows and I got the job of tying them off with elastics again. She printed and cut the snowman soup poem tags I made and tied them along with a candy cane to the bags with a colorful ribbon. I let my daughter embellish the bags with googley eyes, buttons and orange foam using sticky glue dots. 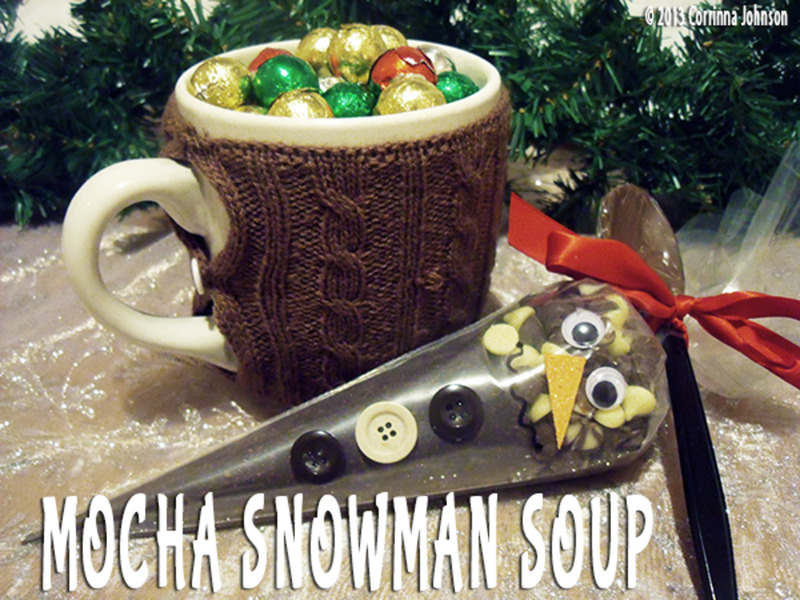 Snowman soup is not only fun to make, it is also a lot of fun to drink! Just pour the hot chocolate mix in a mug of hot water or milk, add a few chocolate candies, top with marshmallows and give it all a stir with the snowman's cane. Or, for the adults, brew a pot of coffee and stir in a few chocolate candies and a splash of liqueur and give it a stir with a candy cane or chocolate covered spoon. I use dozens of decorating bags a month and this huge value pack of 100 bags saves me a ton of money. Pour hot chocolate into a disposable decorating bag and seal with an elastic. Snip the extra plastic off 1/2" from the elastic. Place inside another decorating bag. Pour the chocolate candies in next and top with marshmallows. Tie the top of the bag with another elastic. Tie a candy cane to the bag with a ribbon. Using glue dots, embellish the snowmen with googley eyes, an orange paper nose and buttons. Draw a smiley face on the bag with a Sharpie pen. I bought this nine pack of cute snowman plastic travel mugs for my daughter to hand out to her friends along with a bag of snowman soup. We filled them with colorful tinfoil wrapped chocolate balls for a sweet surprise! Fill Up The Mugs With Candies For A Special Surprise! I made a few bags of snowman soup with red and green M&M's for the kids. My daughter is crazy for them and made all her friends bags with these Christmas chocolate candies. They make your hot chocolate taste extra creamy and rich. *This is my cost using powdered hot chocolate mix. Substituting coffee may increase your costs and will vary depending on the brand of coffee you buy. This coffee is so delicious and is what I used to fill my bags of kahlua snowman soup with! I brew a pot on the weekends as a special treat to myself. I like the french vanilla flavored one the best. Pour 4 scoops of Kahlua flavored coffee, enough to brew one pot of coffee, into a disposable decorating bag and seal with an elastic. Snip the top of the plastic off 1/2" from the elastic. Place the bag of coffee inside another decorating bag and fill with 1/2 cup of chocolate chips. Seal the bag with another elastic. Tie a french vanilla candy cane or small bottle of Kahlua liqueur to the bag with a gold or yellow ribbon. Using glue dots, embellish the snowmen with googley eyes, an orange paper nose and yellow buttons. Draw a squiggly face on the bag with a permanent marker. 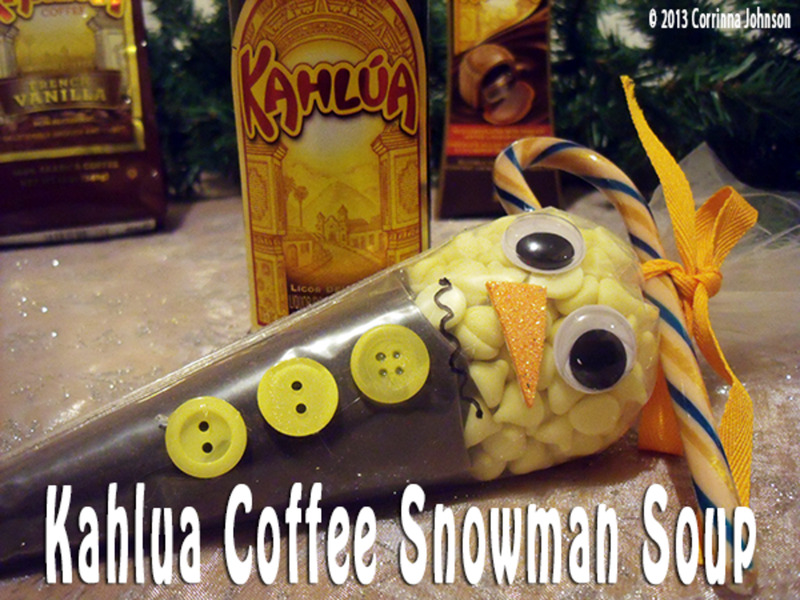 Tie a mini bottle of Kahlua Liqueur to the bag of snowman soup with a Christmas ribbon. Add a box of Kahlua filled chocolates, a regular sized bottle of Kahlua or a pound of Kahlua coffee to a gift bag. I love eating 2 or 3 creamy Kahlua chocolates with my French Vanilla Kahlua coffee on Saturday and Sunday mornings, even if it is only 6:00am. Coffee, chocolate and Kahlua liqueur are absolutely perfect together. Mmmm, heaven on earth, in my humble opinion! Pour 4 scoops of your favorite brand of coffee into a disposable decorating bag and seal tight with an elastic. Snip the top off, leaving 1/2" from the top elastic. Place the bag of coffee inside another decorating bag and fill with 1/2 cup of mixed white and mint chocolate chips and seal with another elastic. Tie a mint candy cane or small bottle of Bailey's Irish Cream liqueur to the bag with a green ribbon. Using glue dots, embellish the bags of snowman soup with googley eyes, an orange paper nose and green buttons. Draw a smiley face on the bag with a permanent marker. Tie a mini sized bottle of Bailey's Irish Cream liqueur to the bag and add a box of Bailey's chocolates and a cute coffee mug to make it a complete gift. Bailey's chocolates taste absolutely divine with a robust, dark roast coffee. 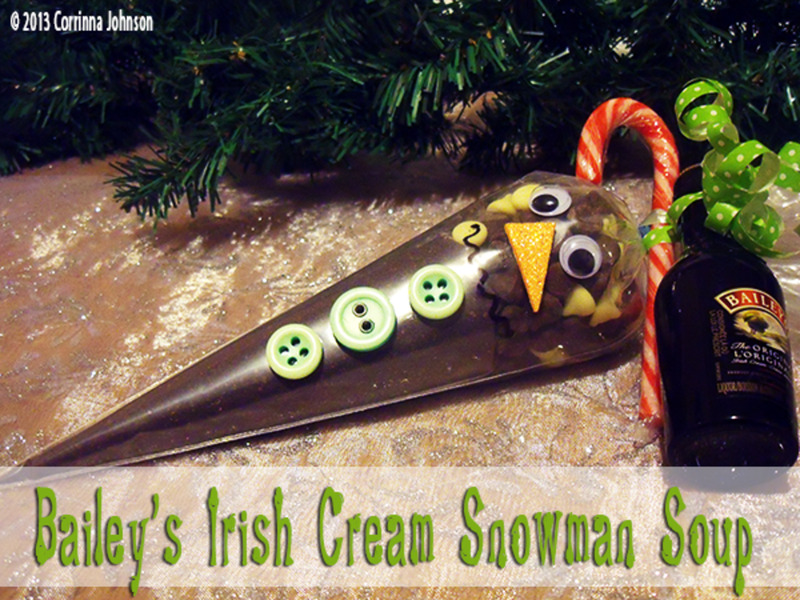 I love to indulge in the rich, minty flavors of Bailey's Irish Cream liqueur inside a sweet chocolate shell, while warming up with a hot cup of coffee on a cold winter's day. Pour 4 scoops of dark roast coffee into a disposable decorating bag and tie with an elastic, snipping the excess plastic off 1/2" from the top. Place the bag of coffee inside another decorating bag and fill with 1/2 cup of semi-sweet or dark chocolate chips. Top with a handful of marshmallows. Seal the bag completely with another elastic. Tie a french vanilla candy cane or a chocolate dipped spoon to the bag with a Christmas colored ribbon. Embellish the snowmen with googley eyes, an orange paper nose and colorful buttons using sticky glue dots. Draw a squiggly face on the bag with a permanent Sharpie pen. 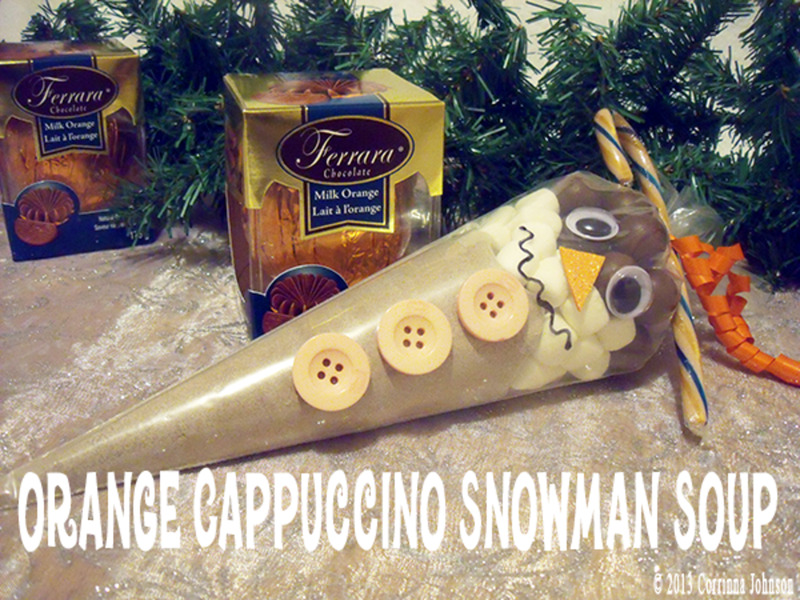 Creamy orange flavored instant coffee is a favorite of my dad's and I had to make an orange cappuccino snowman soup specially for him. Tie a mini bottle of orange flavored liqueur to the bag and pair it with a chocolate orange or candied orange peels. These are little balls of chocolate filled with tiny bubbles and orange flavored goodness. They are so addicting, I could seriously eat the whole bag in one sitting. Stir them into your coffee or savor them one by one as you sip on your cappuccino. Pour orange cappuccino into a disposable decorating bag and seal the bag with an elastic, snipping the extra plastic off 1/2" from the top. Place inside another decorating bag and top with marshmallows and orange chocolate balls. Tie the top of the bag off with another elastic. Tie an orange or french vanilla candy cane to the bag with a ribbon. Embellish the snowmen with googley eyes, an orange paper nose and buttons using glue dots and draw a squiggly face on the bag with a Sharpie pen. 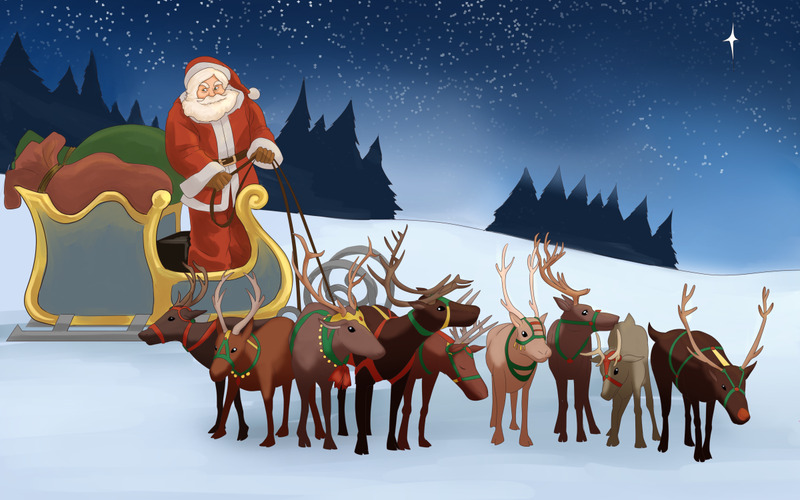 They sell sugar-free hot chocolate mix, sugar-free chocolate candies, sugarless candy canes and even sugar-free marshmallows on Amazon and in some health food stores. 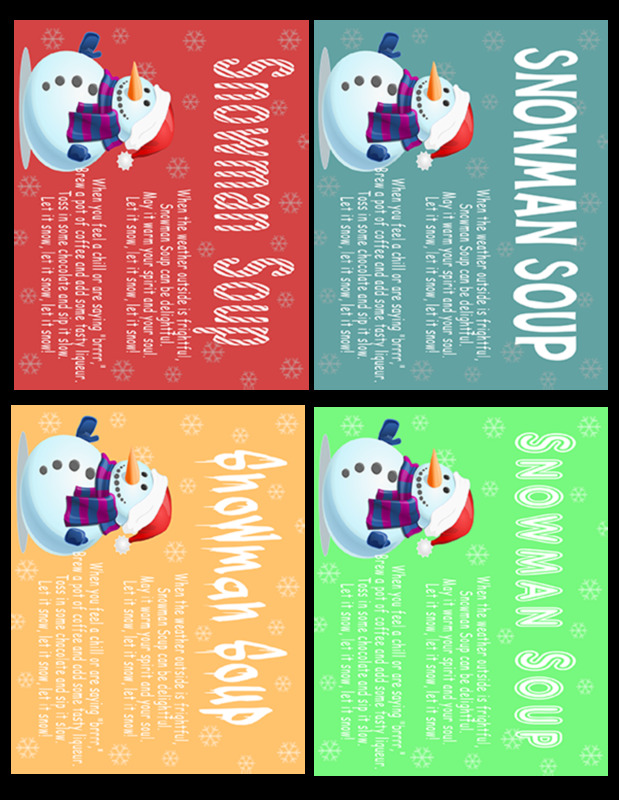 Would You Like To Receive Some Delicious Snowman Soup In Your Christmas Stocking This Year? 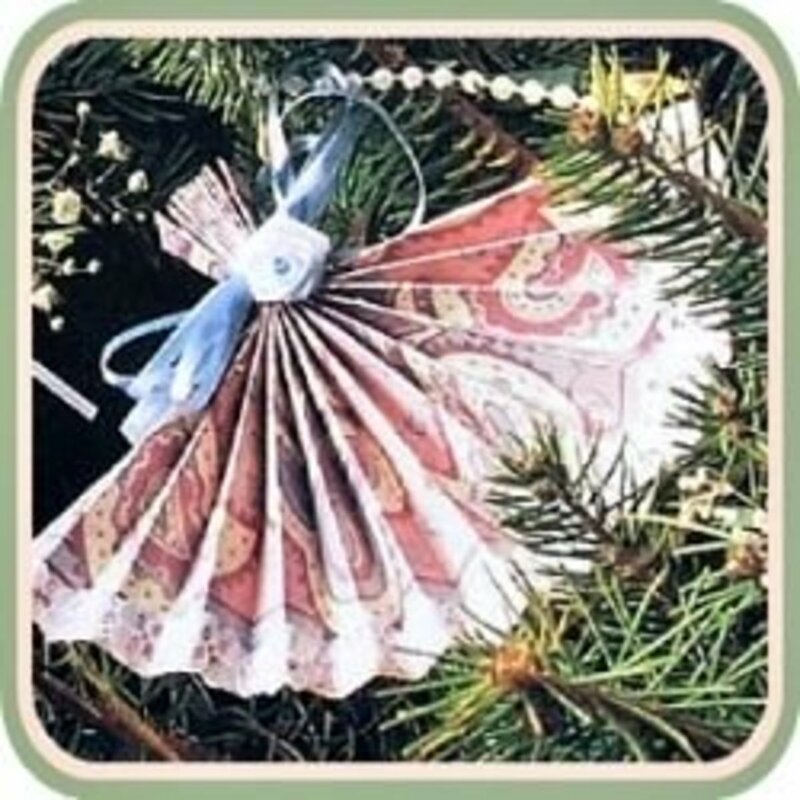 Thanks ever so for sharing these lovely recipes and images - really useful. I love this idea! Homemade is a gift from the heart. Wow what a great idea and lens. Thanks for sharing! Make it a great day! What a great idea for stocking stuffers and hostess gifts. This looks good. Consider it book marked for later reference. What a great idea, and so cool to have so many variations to try! 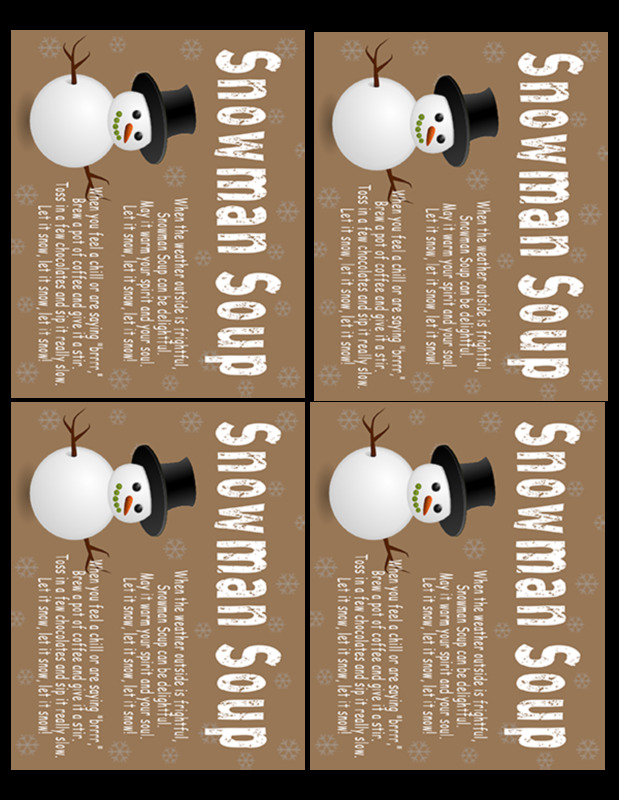 Yes, I'd certainly like to receive some Snowman Soup :-) What a great idea and what a beautifully crafted lens. Thanks for sharing with us! Wow, this is incredibly creative - esp. all the different kinds your feature (and so nice you include the tags). I appreciate that you broke down the cost structure for these too - it'd be a great project for kids to make at school. Thank you so much for this brilliant article. These are so darned cute. What a wonderful idea. Awesome! You really went all out with the flavor variations. Love these!! Yes, please. Totally fab. Love, love, love these. These are incredibly cute - snow much fun! What a fantastic lens. I think this is a great gift. Thanks for sharing.